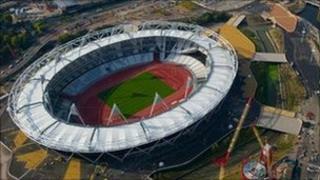 A dispersal zone is due to come into force in the Olympic home borough to tackle anti-social behaviour. Police in the E6 area of Newham will have the power to order people not from the area to leave, as from 12:00 BST on Saturday. Any PC or PCSO can also ban people from returning for up to 24 hours at a time. The east London borough of Newham is home to the Olympic Park, containing the Olympic Stadium, velodrome and athlete's village. Dispersal orders are typically used to break up groups of problem drinkers. A Metropolitan Police spokesman said: "Following success from other dispersal zones in Newham, and requests from both residents and local businesses, it was decided to implement one in this area to reduce anti-social behaviour."